I often say that a smartphone is just a display you interact with, which makes the need for a high quality screen paramount. This is even more true for tablets, which are quite literally large touchscreen displays that the user interacts with. With tablet displays having peaked in terms of resolution for the time being, manufacturers are now turning their attention toward color accuracy. Flagship devices like Samsung's Galaxy Tab S tablets and Apple's full sized iPads feature displays with an exceptional level of color accuracy, while smaller or less expensive tablets are more hit-and-miss. Unsurprisingly, the ZenPad's display is very similar to that of the iPad Mini 2 as far as brightness, black level, and contrast are concerned. While Apple has decided to round 7.85" to 7.9", and ASUS has decided to round to 8.0", I'm fairly confident both devices are using the same LCD technology with different backlight arrays. 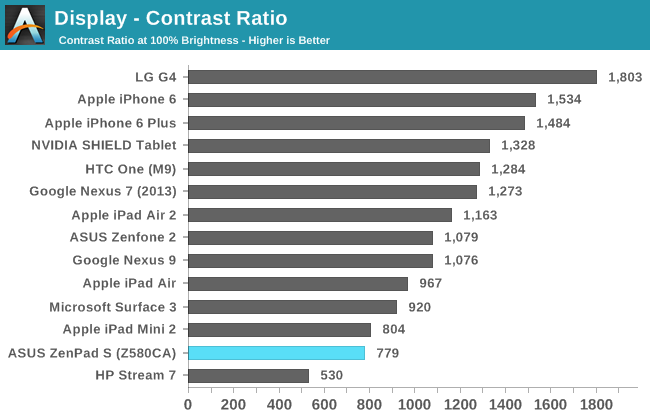 It should be noted that while the contrast ratio is similar in our measurements, when there is ambient light there will be a much more significant drop in contrast on the iPad Mini 2 due to its unlaminated display. Even if two devices use the same display panel, the color characteristics of each can vary significantly depending on the level of calibration, as well as the spectral range of the LED backlight used. Apple’s iPad Mini 2 achieves a level of greyscale accuracy where errors can only be seen in static content, and is good enough for editing photos and videos without concerns about the accuracy of the images. The ZenPad S doesn’t do as well, with a significant blue shift to most shades of grey. This is also reflected in the display’s high average white point of 7331K. While the ZenPad S doesn’t cost as much as an iPad Air 2 or a Galaxy Tab S2, the Z580CA’s price of $299 is exactly the same as the iPad Mini 2. 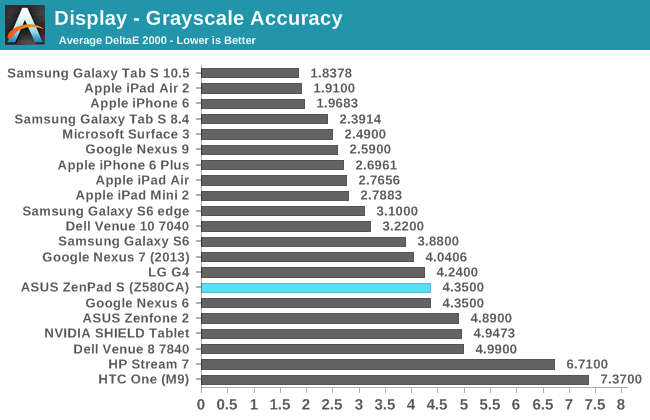 With that in mind, it’s concerning to see such a gap between the greyscale performance of the ZenPad S and the iPad Mini 2. 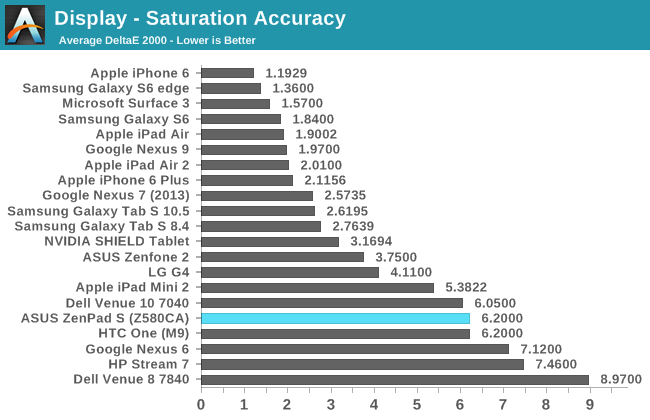 Saturation accuracy on the ZenPad S is much lower than what could be achieved with more attention paid to the display’s calibration. 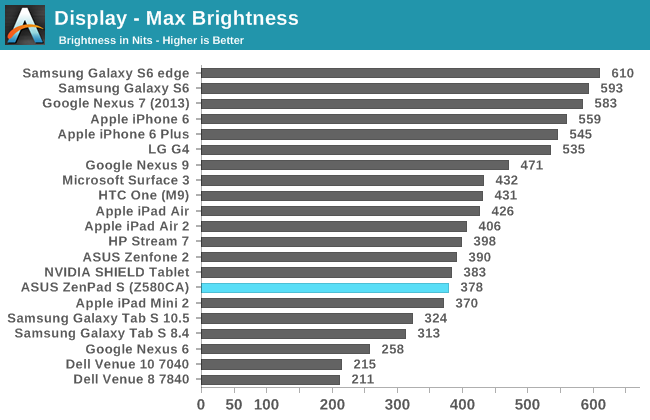 With a DeltaE average of 6.2, the ZenPad S is actually less accurate with rendering primary and secondary colors than the iPad Mini 2, despite the latter having a backlight array that only allows for narrow coverage of the blue and red parts of the sRGB gamut. The spectral range of the LEDs in the ZenPad S almost covers the entire sRGB gamut, but the panel undershoots significantly with reds, overshoots with blue beyond 60% saturation, and has various levels of inaccuracy with yellow, cyan, and most of all, magenta. I was really excited to see that the ZenPad S doesn’t suffer from the narrow gamut of the iPad Mini 2, but I was let down when I realized that the accuracy of primary and secondary colors was actually worse than the iPad due to inadequate calibration. 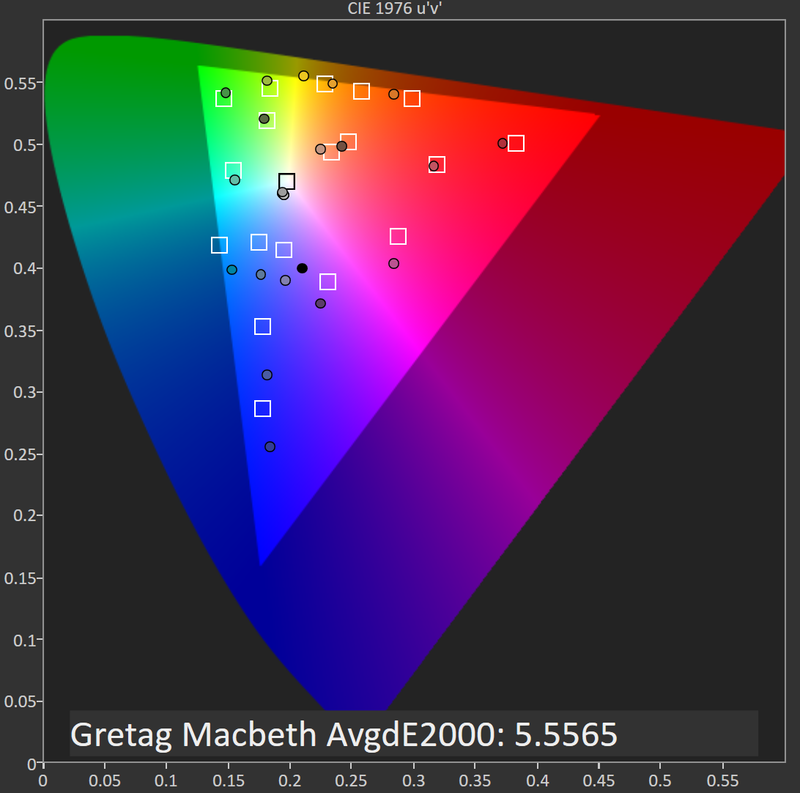 Accurately reproducing color mixtures requires a reasonably accurate gamma, RGB balance for grey shades, and accurate saturations. Gamma on the ZenPad S is reasonably accurate for a mobile device, but the way the display tends toward blue coupled with the inaccurate saturations results in inaccurate color mixtures as well. 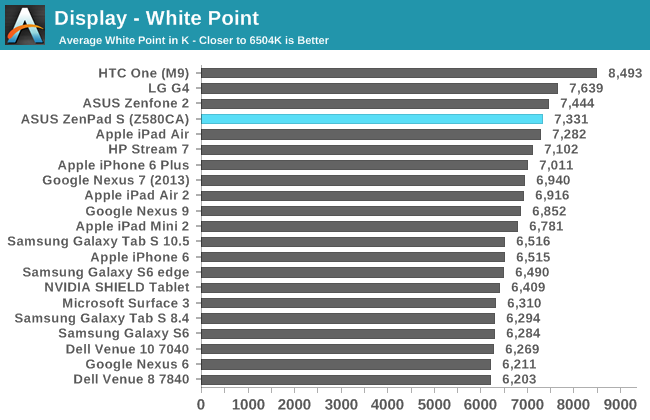 The ZenPad’s average DeltaE of 5.55 doesn’t compare favorably with the iPad Mini 2’s DeltaE of 3.4 which is imperfect but still fairly accurate. 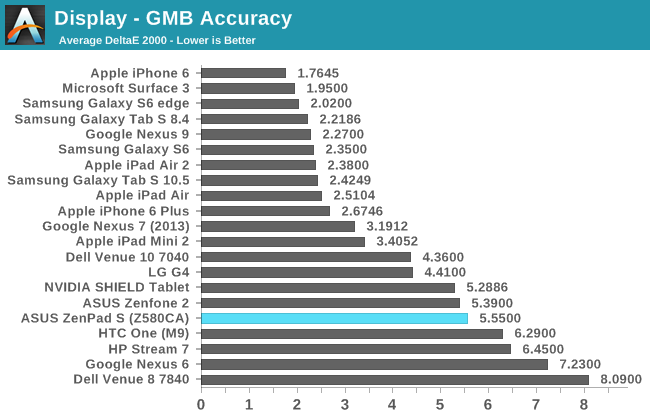 The reason that the iPad Mini 2 ends up being more accurate is because while it cannot be accurate outside its native gamut, within the section of sRGB that it does cover it is very accurate. As far as the default display configuration of the ZenPad S goes, I’m not exactly thrilled. While it does have a wider gamut than the iPad Mini 3, it ends up being less accurate in every respect due to issues with rendering primary and secondary colors, and a blue shift in the greyscale. 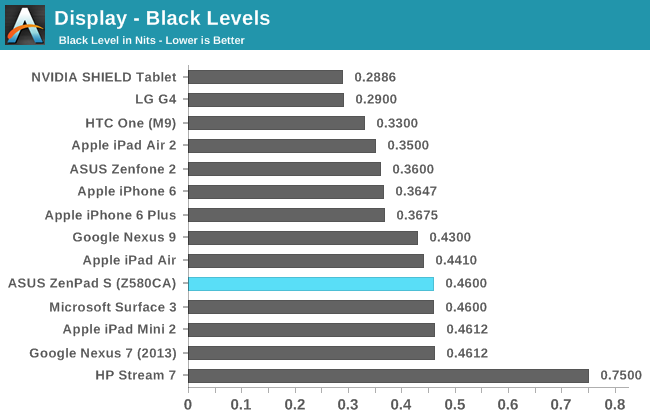 Surprisingly, the ZenPad S having a fully laminated display has done nothing to reduce black levels and increase contrast ratio when compared to the non-laminated iPad Mini 2 display, which is an additional disappointment. However, ASUS does provide a few settings to tweak the display, and so hope is not lost.